ANEST IWATA USA, Inc. is pleased to announce the release of our W400-LV Compliant Spray Gun officially approved in specified locations and is subject to the conditions of the regional air quality agency. 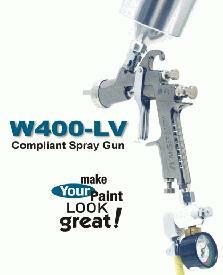 • Air inlet pressure supplied to the W400-LV spray gun shall be equal to or less than 20 psi. Information about these approvals is available on our web site or call 1-800-440-0282 for details. You may also consult with the regional air quality agency in your jurisdiction.